The Census Bureau yesterday released a list of the fifteen fastest-growing cities in the United States between 2015 and 2016. Ten of the fifteen are in the South. Four of the top five are in Texas – or the Texas Urban Triangle to be exact. The fastest growing city was Conroe, Texas, a suburb of Houston. It added 82,000 people last year, a population increase of 7.8 percent. That’s 11 times the national growth rate of 0.7 percent. 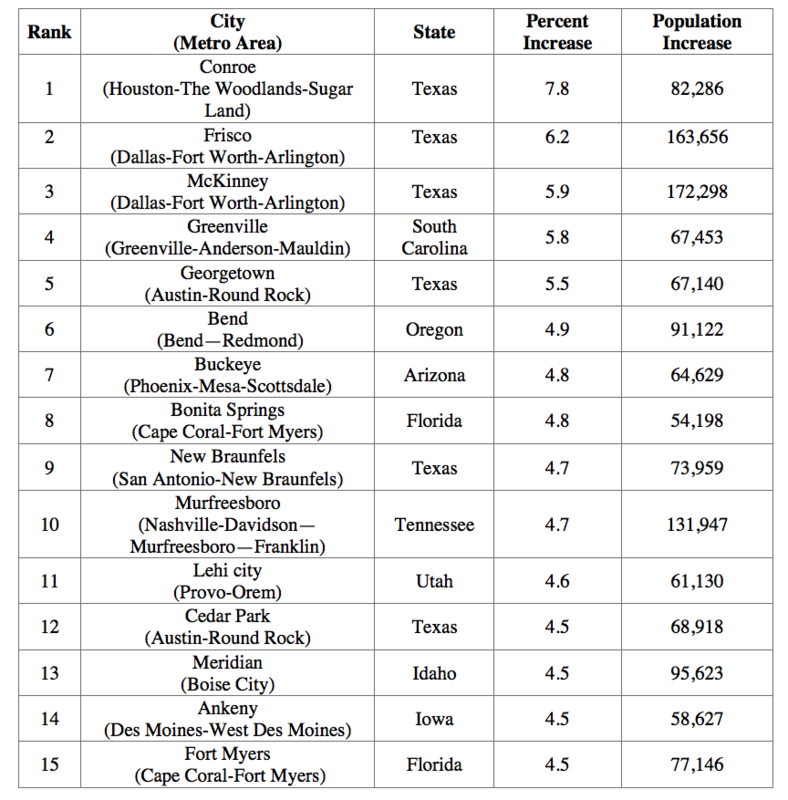 Below is the Census Bureau table listing the fastest-growing cities ranked by the percent increase in population. That Texas contains four of the top five, and six of the fifteen, fastest-growing cities comes as no surprise to NumbersUSA members. We have been pointing out that Texas is leading the nation in population growth and related urban sprawl since 2011, when we presented at the first Earth Day Texas. This past year, NumbersUSA concentrated on the Texas Urban Triangle, where most of the growth in Texas is taking place, producing a sprawl study that details how much that area has sprawled since 1982, and how much more open space is likely to be lost in the state by 2050. We found that Texas adds about 455,000 people to its population every year, or about 8,750 every week. This means that Texans need more houses (115,000/year), more roads (2,500/year), and everything else associated with a (rapidly) growing population. The cost is the loss of open space, 2,500 acres every week, or 120,000 acres every year. To put that into perspective, that’s about the equivalent of putting 120,000 new football fields every year in places that used to be wildlife habitat or agricultural lands. The forests, fields, and prairies of Texas are rapidly disappearing, and in the areas of Texas that contains the most wildlife and landscape diversity; and the most fertile croplands. Almost every single person we spoke to at Earth Day Texas 2017 expressed opposition to greater urban sprawl, and many asked “what can we do about it.” The answer is complex, but the main thing people need to realize is that this type of growth is not inevitable. State and local policies encourage growth, by offering subsidies and tax breaks to corporations who relocate to these jurisdictions, and by encouraging sprawl development, with the long-term costs borne not by the developers, but by public tax monies. Federal immigration policy is the main driver of population growth. In Texas, immigration was responsible for 57 percent of population growth between 2000 and 2012, and overall population growth in Texas was responsible for 67 percent of urban sprawl over that same period. Looked at this way, the federal government is forcing rapid growth and urban sprawl on the American people, despite the fact that most Americans do not favor such growth. It’s up to us whether we continue down the same path. If we do, we must acknowledge that the continuation of urban sprawl means many of the plants and animals we now share space with will disappear; agricultural production will become much more intensive, food more costly and less varied; and the physical and mental health benefits that come from having open spaces around us will no longer be available.